A yearly event around the beginning of December, and St. Petersburg comes to the Royal Northern College Of Music. I didn't know, but Manchester and St. Petersburg are twin cities, and have been since 1962. The Kalinka Youth Balalaika Orchestra, the only one in the UK, is Manchester based, but receives regular tuition and support from Russian greats at this instrument, and this evening I was surprised at just exactly how young (Primary age) and how talented some of these players were. The Balalaika (a traditional Russian three-stringed 'guitar') Orchestra comprises several sizes of this instrument including a Contrabass, an enormous triangular-shaped instrument which is plucked with a large and hefty leather fret, and is the only one in the UK. On the opposite side of the semi-circle sit the Domra players. The Domra being another traditional guitar-like instrument, but this time looking more like half of a basketball, and again usually with only three strings. It is the Domra that play the fiddly bits whilst the balalaika play tune and bass-line. The sound is unique, but I would also imagine the repertoire which they are able to play is limited. 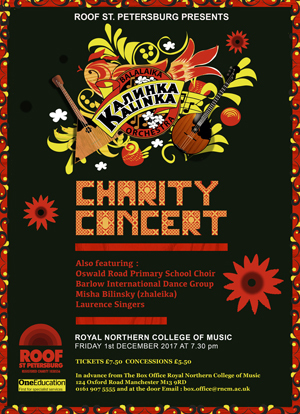 This evening the concert also featured a group of 5 ladies known as The Kalina Singers, a group of traditional Russian folk dancers called The Barlow International Dance Group, The Laurence Singers, and Oswald Road Primary School Choir. The concert seemed long when in fact it needn't have been. A too-long 30 minute interval certainly didn't help, and the running order of the concert along with many announcements meant that the concert was extended beyond reasonable. In fact, judging by Musical numbers alone, they could all have been performed in one non-stop session without interval. This would have been tighter, more interesting and preferable to me. However this was a charity concert and so we had to listen to an address by the Lord Mayor of Manchester, and a couple of passionate speeches about the charity, ROOF St. Petersburg, and its work by Neil Gilroy. The concert was MC'd and organised by Ludmilla Jones, and although her introductions to each piece were interesting, this information would have been better in the programme. However, back to the music. I really enjoyed listening to the balalaika pieces. Not at all what I would have thought of as being Russian music at all (one piece was a traditional melody from Belarus and at least one from Ukraine). In fact the music sounded much more like Klezmer music to me, with one piece very reminiscent of The Third Man title music. The Laurence Singers were superb in their rendition of the Hail Mary (Bogoroditse Dyevo) from Rachmaninov's Vespers, singing unaccompanied and without sheet music in Russian and sounding wonderful. But the absolute stars of the evening were of course Oswald Road Primary School Choir. Sitting in their choir stalls for the entire first half of the concert without singing was unfortunate, but they sat still and were excellently behaved nevertheless. However, in the second half, and when it was their turn to shine, shine they did! The choir's first song was unaccompanied and sung in Russian, and was the beautiful folk song, ' Paidu L'ya' (Shall I Go Out?). This was followed by a lovely round song with repetitive rhythmic bass, again unaccompanied, the clever, 'Welcome' which came to a lovely and surprisingly quiet conclusion. They followed this with their all-dancing version of the Queen hits We Will Rock You / Don't Stop Me Now and received deserved uproarious applause for their set. Well done all! As an addendum to this, both my companion and I noticed and remarked upon one young girl, dressed in a white shirt on the back road and at the end. Her dancing and commitment to the pieces was not only hilarious, but it was spot-on and utterly brilliant! She stole the show for us both! The concert was enjoyable, and I feel that I have learned much about Russia and Russian music in my time in the company of these artistes, but I do feel that the concert as a whole lacked a certain organisation and precision, and it came across as disorganised and unprofessional because of it.